Director of rugby Richard Cockerill insists Leicester Tigers do not need to make radical tactical changes after three successive Premiership defeats. 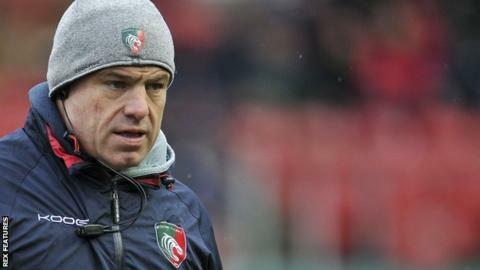 Tigers have lost to Sale, Newcastle and Harlequins and are now fifth prior to Sunday's home game with London Irish. Cockerill told BBC Radio Leicester: "Three poor results does not mean we are a poor team. "We're going to do what we've done but are going to make the right choices at the right times and be more accurate." Former All Blacks centre Aaron Mauger was added to the Tigers coaching staff in the summer and has been instrumental in getting the team to play a more expansive style. Cockerill said they would not be abandoning that plan, but need to recognise when they can play more attacking rugby. He added: "We have had a bit of a blip. Do we need to manage our games better? Yes. Do we need to run and entertain the whole time? No. "We need to make sure we get that balance right and we still grow and develop as a team, but also win."